It isn’t “acceptable” in polite society to support Donald Trump, I am told. America’s bullies – the sneering, “we know better than you” establishment classes – have made many cower in silence rather than proclaim that Trump is a tremendous presidential candidate and has earned their support. It is a replay of the worst aspects of high school peer-pressure, about what’s OK and what isn’t, based on selfish interests and prejudices. Well, enough of that. Trump is already changing America for the better – and is encouraging us to boldly stand up for our beliefs about what’s best for our nation and best for our fellow Americans. So let’s get right to it. Shifting America back on course requires Donald Trump as the Republican nominee. 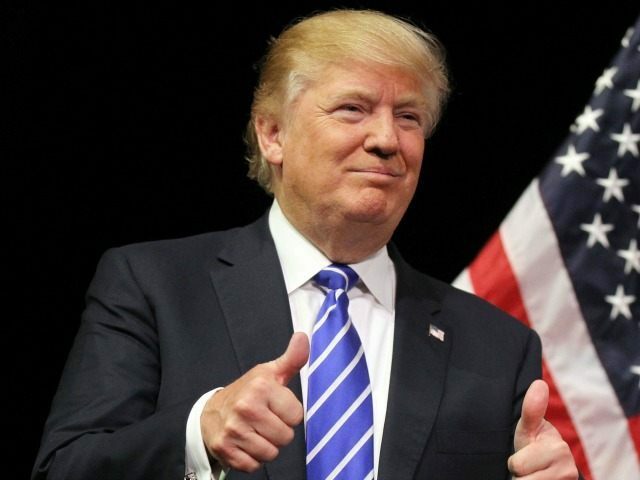 Not only is he the only Republican candidate who could win the general election, but he is the only choice Republican voters should consider (and should consider themselves lucky to have on their side). It’s make or break time – and drastic times call for, well, not drastic measures but certainly something different. America is headed towards demise. If the old adage is that ‘insanity is trying the same thing time and time again and expecting a different result,’ why would we nominate the usual type of politician? 2. 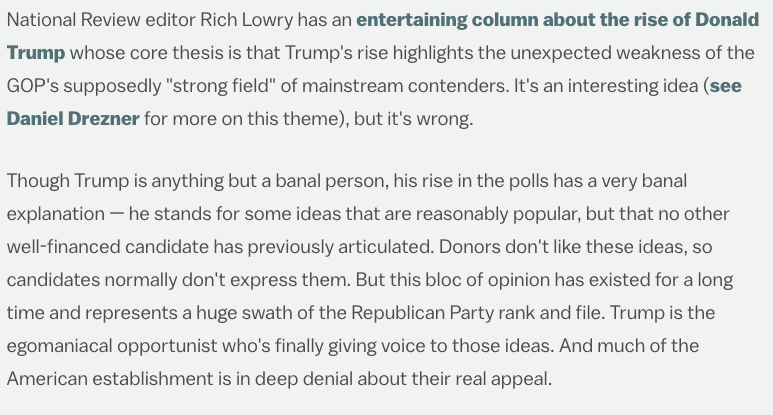 Trump is not reliant on donors. This cannot be overstated enough. Not relying on donors – especially not following the Rubio-model of huge support from just a handful of individuals (as a Gawker piece rightly predicted last year) is crucial. No one will own Trump. Yet the Trump-attacking conservative pundits continue to scoff that he doesn’t have the cash to see this campaign through. This is an astonishing, frightening smear. Why? Because it means we no longer even bother with the pretense that money doesn’t buy an office. The “he doesn’t have the big donors/funding-network to go all the way!” smirk is precisely why he should. 3. Yes, he doesn’t have much of a filter. Bravo. 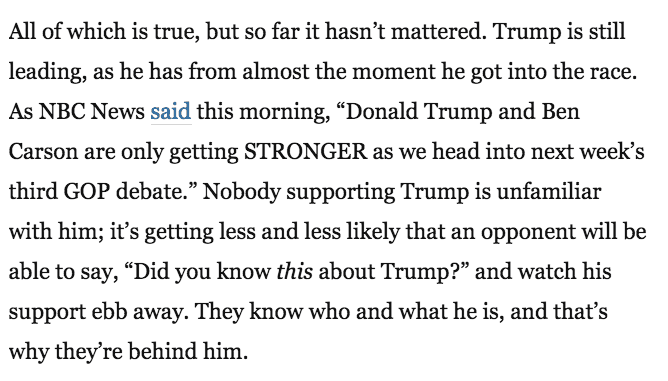 We keep hearing from the Trump-naysayers that’s Trump’s mouth is a problem. But where you see a loudmouth, I see candor. Where you see a lack of filter, I see transparency. Where you see a man who gaffes, I see a man who is willing to wipe the cancer of political correctness out of our society. Where you see a loose cannon, I see a man who says what he means and means what he says. Or, would we rather the typical Hollywood celebrity or establishment politician (the two are remarkably similar) who runs a statement by 20 handlers, 10 advisers, and a social-media team before making it? Do we wish to be led by an individual who does not speak from the heart but rather prefers to be advised on what to say and when to say it? Do we wish to be led by a politician who waits to see how the polls emerge on a subject before issuing an opinion? Do you seek a president…. or a ventriloquist puppet who’s views who you do not truly know? 5. Make no mistake, there is an establishment plot against him. The establishment really, really doesn’t want him – but we really, really do. So their takedowns keep backfiring. 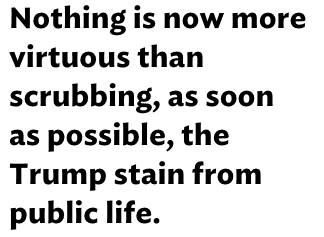 Consider this quote from George Will, which doesn’t at all sound hysterical! Attempt after attempt on ‘Teflon Trump’ slides right off him and instead backfires and blows up in their collective faces. It reminds me of a scene in “Gladiator” (indulge me for a minute – there is a side of me that is a 19-year-old bro), where Commodus (after attempting to orchestrate Maximus’s death by forcing Maximus to fight the greatest living gladiator, only to have Maximus turn the tables by not only besting the opponent but showing him mercy), in a fit of frustration, exasperatedly wails: “And now they love Maximus for his mercy! So I can’t kill him or it makes him even more merciful. The whole thing is like a great nightmare!” That is not unlike what is happening right now in the smoke-filled rooms of the establishment. Take the Megyn Kelly incident – naysayers said Trump would be doomed among conservatives by feuding with a fairly popular Fox News host. Except, conservatives didn’t care. And poor Jorge Ramos, who self-imploded when he tried to confront Trump, coming across as an unhinged, angry activist rather than a professional journalist. 6. Diplomacy. We also keep hearing Trump isn’t “diplomatic.” Interestingly, though, it is Trump who is willing to sit across the table and actually talk to Vladimir Putin, while we have other GOP contenders calling a hugely popular First World nation’s leader a “thug.” (Free advice: It isn’t presidential to refer to another world leader, the elected leader of a first world nation, using ad hominem attacks. Not very Reagan-ite.) Remind me again who’s the diplomatic one? For an alleged blowhard, Trump sure is diplomatic when it counts. To that end, he’s also sensible. Despite describing the Iran nuclear agreement a “disastrous deal” and “horrible contract,” he said he would work it. Meanwhile, demagogue candidates were proclaiming they would (despite the impossibility of doing so) rip it up on “Day One” – sounds swell. 7. His business accomplishments. Shocker! Imagine having a president who has actually built and created things! Imagine having a president with a proven track record as an enormously successful businessman. But, silly me – why have that when we can have, for instance, a first-term senator, career-politician who’s never even passed any significant legislation or a governor whom, despite some laudable accomplishments, most of the nation, including Republicans, can’t stomach? 8. He’s pro-women. In the plot to take down Trump, one of the first tactics tried was to cast him as anti-women. But Trump has worked with many peers and sparred against many rivals – male and female alike – and thus actually shows he treats women as equals (e.g., Yes, he joked about Carly Fiorina – he also joked about Rand Paul. Get it?). Or are we, as women, demanding to be coddled and spared the same treatment as the gents? 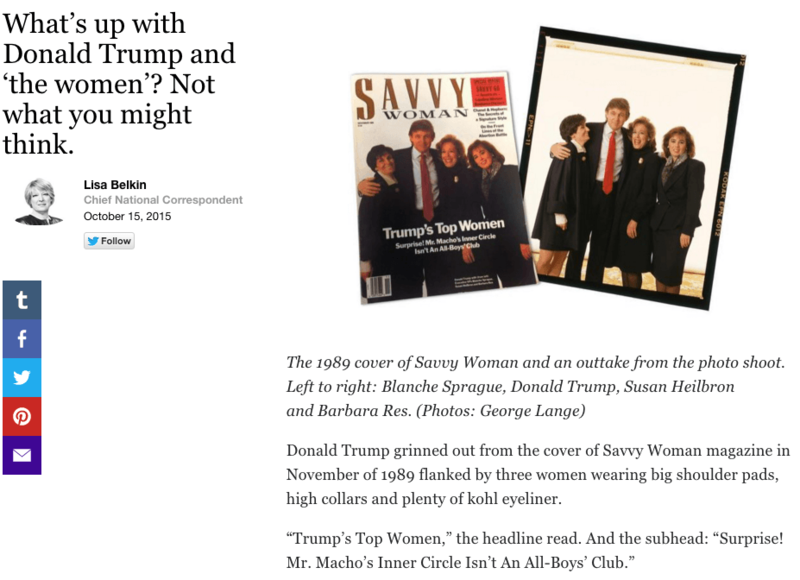 Last week, an article by Yahoo!’s Chief National Correspondent found Trump has a history of building women up. 9. A stellar first family. We often forget that we are not only choosing a president but choosing a First Family. While the other candidates all have perfectly nice families, none has the potential for impact as the Trumps. (Before you say ‘the Bush family’ – stop. That family is more overexposed than Taylor Swift – go away for a while and maybe we can miss you.) Melania as First Lady? Absolutely. A poised, elegant, intelligent woman, already accustomed to the spotlight, who is an immigrant herself with a keen interest in women’s health issues. His children? Where to begin? Ivanka, for instance, would be a tremendous role model across the world – a working mother who is a thriving entrepreneur. And, in 2015, is it not time to consider having a ‘blended,’ modern family as the First Family? 11. The celebrity factor is actually a huge plus. If you’re reading this article, you’re someone who follows politics and stays informed. Hey, congrats — proud of ya. But guess what? The majority of the American public does not. They’ll vote – if they can even be bothered to do so on election-day – for a candidate based on gut instinct or name recognition (how else do you think the Kennedy’s get elected?!). And, newsflash: Save for some parts of Texas, it isn’t OK to say you’re a Republican these days, thanks to years of liberal academia and Hollywood beating our image like a rented mule. But Trump can bridge that gap. 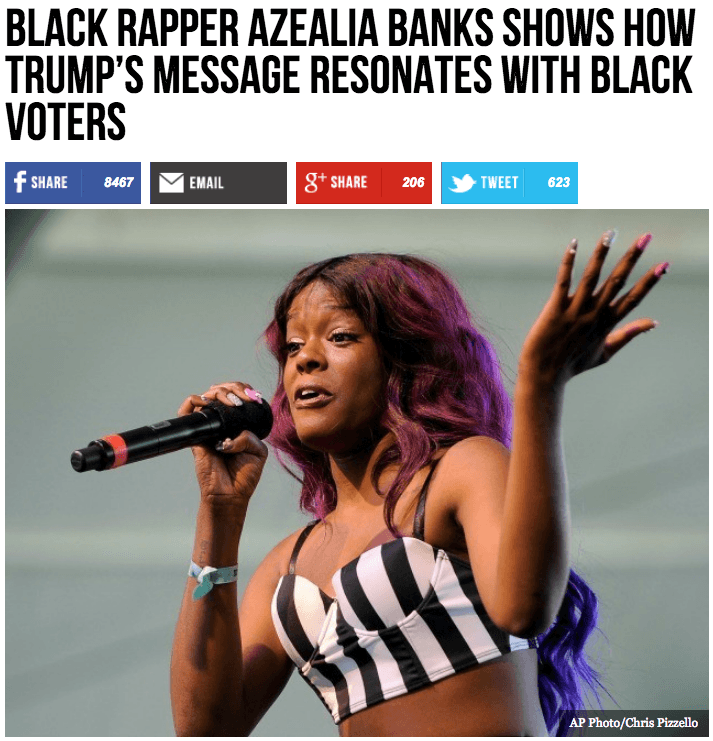 It’s conservatism … but represented by a well-liked celebrity. How much clearer can this be? Trump is a God-send. Finally, we conservatives caught a break! 12. His policies are spot-on, particularly immigration. For brevity, this article is not meant to discuss the nuances of Trump’s proposed policies and positions. But he’s right on pretty much every position he espouses, first and foremost that of immigration, the most critical issue facing America. In fact, if you vote based on one issue, make it that one, as it affects all others. 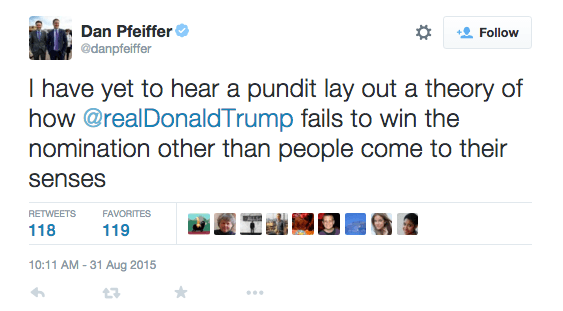 And only Trump has the correct view, out of every GOP contender. Moreover, each time he makes an ‘inflammatory’ remark, the stats back him up. How about taxes? 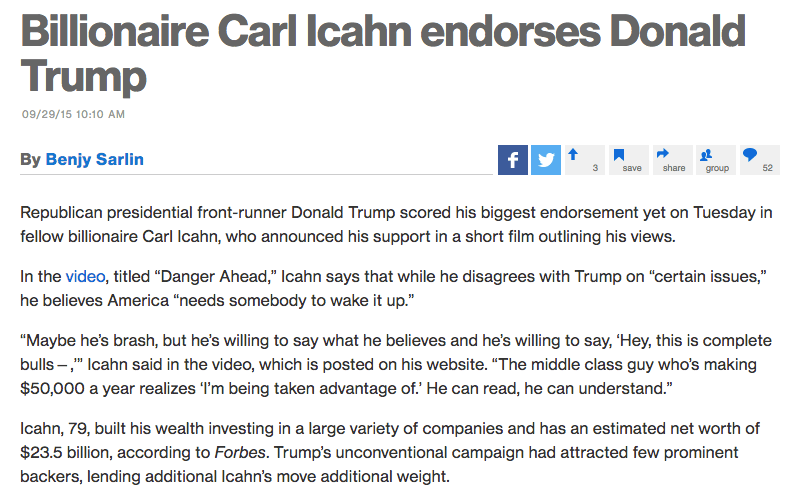 Trump is the only one willing to take on the hedge-fund managers and blast their ridiculously unfair tax rate. It’s the ideal position – someone with a conservative tax plan but who realizes attacking the hedge-funders’ sweet deal doesn’t make one a “liberal” – and simply shows an individual with an astute understanding of finance and a genuine sense of fairness. 14. The naysaying is rooted in careerists’ self-interests. Too many conservative writers and conservative TV pundits are out for their career security and financial bottom line — not to save the nation or save conservatism. Do you work at an outlet where the owners/donors/funders don’t like Trump? Here come the articles blasting him! (Because your career and your paycheck matter more than the good of conservatism, the nation, or your conscience, apparently.) Better yet, are you a network contributor or network TV host at a network whose top brass prefers another candidate? Tow that line! Ca-ching! (Ever notice how rarely some conservative pundits criticized the “Gang of 8” amnesty bill? Well, now ya’ know!) And, even above all that, do you want to fit in with the smarmy, snickering conservative writer/pundit so-called “smart set,” who simply can’t stomach the idea of having to publicly stump for, ewwww!, celebrity Donald Trump next year, should he win the nomination? Ridicule him! And, if you really want to earn a pat on the back, attack his supporters, too! Aside from this, there is the political consultant class, whose entire cushy livelihoods are threatened by Trump’s rise. Why? He’s shown you can make it without their useless input and advice. The pointless wizard behind the curtain is revealed – uh-oh. Standing up for Trump is also standing up against these Pharisees. 15. Negotiation skills. Presidents have the benefit of being surrounded by highly talented experts in their respective fields – it’s the entire basis for the Cabinet appointments. But, what’s the one area on which a president is on his own? Negotiations. When our leader walks into an international forum, or that one-on-one meeting with the British PM, there is no adviser that can speak for him. It’s the one time the president sinks or swims on his own merits. As such, a stern – even arrogant — president with negotiating expertise is of paramount importance. Governors have keen negotiating skills, sure – so do CEO’s. Trump is so good at it, though, he – literally – wrote the ‘bible’ on it. 16. Many Latinos love him. Speaking of Jorge Ramos…. 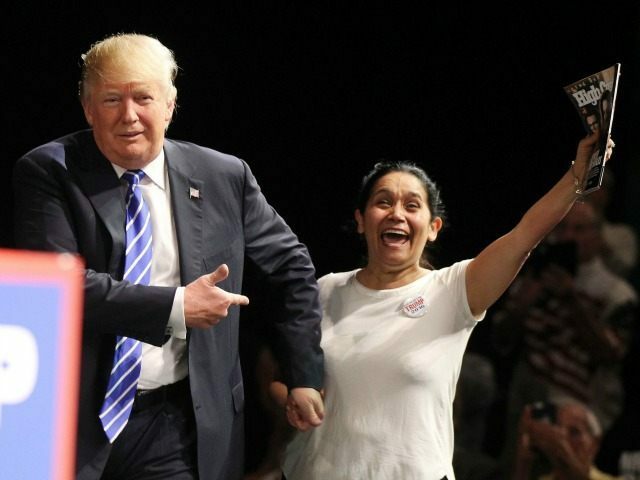 The media keeps insisting Latinos despise Trump. Except, we don’t. In fact, many of us love him. Myriam Wichter, the Columbian immigrant from the recent Las Vegas Trump rally, is not an anomaly. Hang-onto-your-horses for this whopper of a ‘revelation’: America’s Latinos have the same wants, needs, and concerns as other Americans! Our priorities are the same as “Anglos”: jobs, healthcare, and so on! A truly novel concept! According to the media, however, Latinos’ main issue is not just immigration but illegal immigration, because, this argument goes, (1) Latinos all came to this country by breaking the law and (2) unlike every other American concerned about the economy or education, of course immigration is their number-one concern! 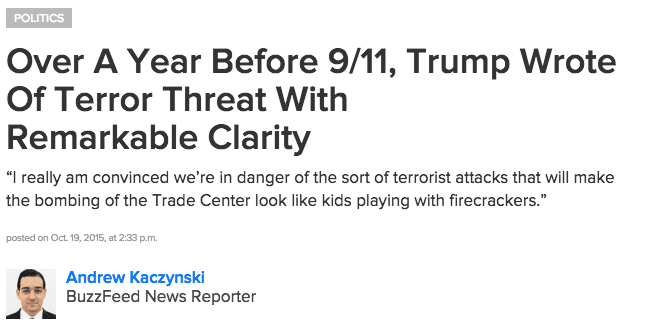 That line of thinking is what’s borderline racist, not Trump’s remark. When VOX’s editor in chief tweets that “Donald Trump’s immigration plan reads like a plot to make sure Republicans never get another Hispanic vote,” as a genuinely-hurt Latina I have to wonder if the media realizes that is far more offensive to America’s Latinos than anything Trump has uttered. I am a hard-working, taxpaying, American who has the same concerns as other hard-working, taxpaying Americans. Yes, “immigration” is on my list of concerns – but as a huge problem, and not something of which we need more. I would nod and take it all in and this larger-than-life, Andrew Carnegie/Dodge-brothers type of figure, felt like a living testament of the capitalism’s greatness in action. While, even a year ago, I never would have envisioned myself writing an article about Trump and the GOP nomination, perhaps, reflecting on this, it makes perfect sense. 19. By process of elimination. If for no other reason, consider the other GOP options one by one. The flip-flopping, amnesty-pusher? Or Jeb? (I truly tried to get excited about Jeb – but one can only try for so long.) The failed technology CEO? The governors who crashed before they’d even begun? There aren’t any other options. Let that sit for a minute and think about it. “They know who and what he is and that’s why they’re behind him.” In politics, what can be purer – and more beautiful — than that? that’s why he’s at the top. – A.J. Delgado is a conservative columnist who’s writings have appeared in Breitbart, National Review, American Conservative, Fox News, and various other sites and publications. She holds a juris doctorate from Harvard Law School and often writes about politics and pop culture.